Cancer is a disease in which cells grow in an abnormal way. Normally, the cells divide in a controlled manner. If cells keep dividing when new cells are not needed, a mass of tissue called a tumor forms. A tumor can be benign or malignant. A benign tumor is not cancer and will not spread to other parts of the body. A malignant tumor is cancer. 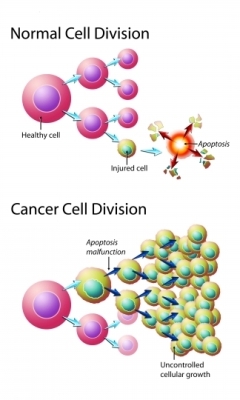 Cancer cells invade and damage tissue around them. They can also enter the lymph and blood streams, spreading to other parts of the body. Thyroid cancer is the development of malignant cells in the thyroid gland. 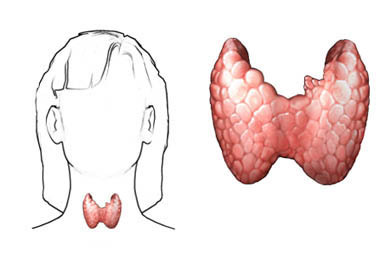 The thyroid is a butterfly-shaped endocrine gland located in the lower neck. It has a thin central body (called an isthmus) and that connect two wing-like lobes. The job of the thyroid is to make and release chemicals called hormones. These hormones regulate certain body functions and can influence major body structures like heart, brain, and muscles. The thyroid gland needs iodine to work properly. Iodine comes from the food you eat and is pulled into the thyroid from the bloodstream. The thyroid is made up of two types of cells, follicular cells and C cells. The follicular cells produce thyroid hormone. The C cells produce calcitonin, which processes and regulates calcium levels in the body. Cell division and cell death are a normal process in the body to replace old or damaged cells. Changes in cell DNA can cause this process to change and lead to cancer. With thyroid cancer, specific genetic markers, syndromes, or radiation exposure are linked to these DNA changes. Cancer growth in the thyroid can interfere with how the thyroid should work and a tumor can press on nearby structures. If it grows beyond the thyroid, the cancer can invade nearby voice box and windpipe. This growth can make it difficult to speak or breathe. If cancer cells reach nearby lymph nodes or blood vessels it can spread to other parts of the body. The most common sites for thyroid cancer to spread are the lymph nodes in other parts of the body, the bones, and lungs. Papillary—Makes up nearly all thyroid cancers. Papillary thyroid cancer generally grows more slowly than other types and are more easily treated. Follicular—Second most common type. Follicular thyroid cancer is most commonly associated with iodine deficiency or radiation exposure. A subtype of follicular thyroid cancer is called Hürthle cell tumor, which is often harder to treat than other differentiated types. Medullary—Rare type that starts in the C cells that produce calcitonin. Medullary thyroid cancer is more aggressive, harder to find, and usually spreads beyond the thyroid gland before it is found. Subtypes of include sporadic (not inherited) and familial (inherited). Anaplastic—Rare type that is aggressive, fast growing, and usually spreads beyond the thyroid gland before it is found. Anaplastic thyroid cancer. EBSCO DynaMed Plus website. Available at: http://www.dynamed.com/topics/dmp~AN~T114292/Anaplastic-thyroid-cancer. Updated June 29, 2018. Accessed December 8, 2018. Follicular thyroid cancer. EBSCO DynaMed Plus website. Available at: http://www.dynamed.com/topics/dmp~AN~T115204/Follicular-thyroid-cancer. Updated June 27, 2017. Accessed December 8, 2018. Medullary thyroid cancer. EBSCO DynaMed Plus website. Available at: http://www.dynamed.com/topics/dmp~AN~T113756/Medullary-thyroid-cancer. Updated June 29, 2018. Accessed December 8, 2018. Papillary thyroid cancer. EBSCO DynaMed Plus website. Available at: http://www.dynamed.com/topics/dmp~AN~T115275/Papillary-thyroid-cancer. Updated August 15, 2018. Accessed December 8, 2018. Stages of thyroid cancer. National Cancer Institute website. Available at: https://www.cancer.gov/types/thyroid/patient/thyroid-treatment-pdq#section/%5F27. Updated August 18, 2017. Accessed December 8, 2018. Tests for thyroid cancer. American Cancer Society website. Available at: https://www.cancer.org/cancer/thyroid-cancer/detection-diagnosis-staging/how-diagnosed.html. Updated April 15, 2016. Accessed December 8, 2018. Thyroid cancers. Merck Professional Version website. Available at: http://www.merckmanuals.com/professional/endocrine-and-metabolic-disorders/thyroid-disorders/thyroid-cancers. Updated July 2016. Accessed December 8, 2018. Treatment option overview. National Cancer Institute website. Available at: https://www.cancer.gov/types/thyroid/patient/thyroid-treatment-pdq#section/%5F67. Updated August 18, 2017.Accessed December 8, 2018.